North America has a bonanza of field guides, all covering pretty much the same birds. But the birds don't appear in the same sequence in all books. So how is a person to find a bird? Alphabetical order is no help if you don’t know the bird's name! Field guides must solve a complex problem—how to arrange a dictionary of pictures so that people can find what they’re looking for. You might think alphabetical would be the way to go, but alphabetical order is no help if you don’t know the bird's name. Sorting the birds by color doesn’t work either, since male, female, and young birds of the same species may not be the same color, and colors may change according to season. And arranging birds by their habitat preferences fails for birds that don’t always stay in the same kind of landscape. The time-tested way for field guides to arrange species is in taxonomic sequence, based on the birds’ evolutionary history.bIn general, shared ancestry corresponds to shared physical form. For example, woodpeckers, which all belong to one family, have two strong central tail feathers that brace the bird against a tree. However, the taxonomic sequence is not fixed. It changes as science makes discoveries about the ancestry of birds. And books tag along. In older field guides, vireos came immediately ahead the warblers. Now vireos appear before the crows and jays. Recently, waterfowl have dislodged loons from their long-held place at the beginning. Field guides change with the scientific advances. The new, Fifth Edition of the National Geographic Guide, shown at left, follows the new taxonomic sequence. You'll find that it begins with the waterfowl, in accordance with recent scientific understanding of how birds evolved. Earlier editions began with loons. Becoming familiar with the taxonomic sequence is an interesting, basic task of becoming a birder. All good field guides teach it. Without understanding taxonomic order, trying to look up a bird is like trying to find a word in the dictionary without knowing the alphabet. For convenient comparison, some guides, such as the Peterson Eastern & Central N. America guide, shown at right, deviate slightly in order to place similar-looking birds together, such as swifts and swallows, even though they aren’t closely related. Other books, trying to ease the beginner’s way, make up their own arrangements. New birders may find that the time they spend learning an unusual system won’t necessarily transfer to another book. 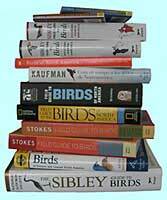 Even the alternatively-organized field guides can be valuable supplements to a birder’s library. Every guide reviewed here has something useful or unique to offer. Pictures are the heart of a field guide, showing the birds’ field marks. Field marks may include a bird’s size, bill shape, facial pattern, and even the manner of flight. For example, field marks let us recognize a male northern cardinal—by its red color, crest, heavy red bill, and black patch around the base of the bill. Field guides usually direct the reader’s attention to field marks with arrows or comments in nearby text. The pictures may be paintings, photographs, or digital blends of both. Most field guides employ painted illustrations. With control over pose, lighting, and background, the artist can emphasize the most significant information. Some books (such as the Stokes Eastern field guide, at left) use photographs, though birds don’t always pose so as to best reveal their field marks. However, good photos do have a certain stamp of authenticity and can show great detail. Some recent field guides now employ digitally processed photos to bring out field marks. Good field guides include what amounts to a beginner’s course in birdwatching, including how to recognize what group a bird belongs to, where and when to bird, suggestions for keeping records, and birding ethics. Time spent studying the fundamentals section will pay off handsomely when a birder goes out into the field. There are hard choices to be made about how much to include in a field guide—whether to go for comprehensiveness or portability. Some field guides (suchas the Sibley Eastern field guide, at left) trim their size by covering only half of North America in one volume, just the birds of the eastern part of the country. No single volume can show and tell everything. If you want to start with just one field guide, it’s probably best to get one that follows taxonomic sequence. As time goes on, you’ll want to acquire more. Best solution: have them all. An earlier version of this article appeared in Bird Watcher's Digest in 2004. It is here updated in November, 2007, to include books that have come out or have been revised since that publication. Here's a new product for learning birds' songs. Just swipe the wand across a bar code. The song comes out of the wide end of the wand. Includes a nice little book with good color pictures of each bird. You can play the song right from the book! The iFlyer comes with an extra set of bar codes to stick next to the picture of the bird in your field guide. Then your favorite book can be a singing guide too!